Dunlop's D404 front motorcycle tire delivers the quality you expect in a motorcycle tire from one of the most experienced manufacturers of tires in the street bike tire market. Dunlop D404 motorcycle tires come in a wide range of sizes that provide great wear and performance in a motorcycle tire. 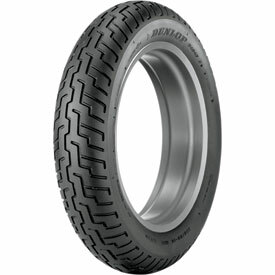 The Dunlop D404 motorcycle tire comes in both front and rear versions for great compatability in a motorcycle tire setup. Over 12K miles on the tire and it has more to go. Handles good On wet roads. Not very long wearing but very sticky! Safety first. Treated me well overall! Bought the tire because the manufacturer of the back tire that fits the rocket doesn’t make one that fits the front... this tire lasted almost 2 years and approximately 18k miles. For the price, this is the best tire I have ever used. I have always replaced my touring and sport bikes with Dunlop 401, s and 404, s. for many years. I wouldn't want anything else. Been running the 404's on several bikes over the years and these just went on a 2008 Yamaha v star classic and so far are working good. They work well and get decent mileage for the price! Excellent price. And the shipping speed was truly incredible. You get all my business. Customer for life. I tell all my buddies too. Keep up the good work! This tire is only a few dollars more than the cheaper "off brand" tires, have used them in the past without any problems. I have not run this tire yet, ice & snow, but i had the same kind before & got 16k on it. I will buy more. I mounted this tire the same time as the dunlop rear on an 03 shadow sabre 1100. It mounted easily and took about an ounce of weight to balance. My wife drags the floorboards occasionally so the handling seems just fine. No problems to mention. This is a good budget replacement tire without going cheap. Great price and shipping speed, excellent manufacture dates as well, almost current. Easy to find, easy to order. Fast delivery! 2nd time I placed this tire on my bike. Nice wear for my type of riding. Looking to replacing this my old tire with a new soon. I've been sending alot of my customers to JW.com for tire purchases. Because of location & fast shipping and so far the best prices on tires. Thanks JW.com!! Dunlop Tires very durable & affordable tires!!!! I would like to thank Jake Wilson for their expert service and extremely fast delivery and of my new tyres. These tires were great replacements for OEM. Not an upgrade. I will try something else next time. Like the title says it is good, decent wear life, alright in the groves in the road it may be a better suit for a little bit lighter bike. But all and all not bad at all looking at about 6500 miles out of it. I'm more partial to the Metzelers now but that is because of how they wear on such a heavy bike. Would buy again if the price was right or I was tight on cash. I bought my front tire from RMATV&MC because I searched local vendors and online sources and they came up as the one to beat!! Their shipping is lightning fast and I'll be returning to them for all of my motorcycle needs!! Thanks to the staff at RMATV&MC for your excellent service!! Great to do business with!! Product was shipped fast, great price, order was correct. <br>Product was shipped fast and free, great price, order was correct. I bought this tire to replace the OEM Dunlop on my Kawasaki VN900 that yielded 19,000 + km. I noticed this one has the red and white line on the tire which I guess indicate that it is a dual compound tire (softer on the outside of the lines and harder on the inside) which should yield even better km's. Have done about 5,000 km since it was mounted and is looking good. I have been running with this D404 on the front of my 2001 LC for many years now. This as to be the best tire on the market for NOT cupping. It has an excellent rubber compound which is uniform right across the thread. Most tires that I seen had cupping issues because of the different rubber compound (hardness) use on the center and side of the thread. If the tire has a hard rubber compound in the center of the thread, both sides of the threaded area will wear out and create some cupping issues making your bike very unstable in turns and/or long sweepers. This tire should get 10 stars !! Well its no touring elite or metzeler, but.. This tire is more of a budget tire, it certainly isn't as good as the me880 I am replacing or the touring elite 3 I had before that. But it is alot cheaper. I am so happy someone other than the dealership carried this tire, they saved me HUNDREDS of dollars and its the exact same tire! Keep up the great job. The tire wears and works great. When was the tire manufactured? BEST ANSWER: We have many of these tires in stock and are unable to guarantee an exact date of the tire that is being shipped to you, especially since we have 2 warehouses that these tires would ship from. All the tires we sell are going to be in new condition and they are stored in a controlled environment so that they do not age.